A VOTE? DID SOMEONE SAY A VOTE? I checked out Publishers Marketplace this morning and what did I find? They are voting on Galleys! So all my blogging buddies! A call for reinforcements! IF YOU ARE SLEEPLESS IN SEATTLE WHAT ARE YOU IN BERGEN? Too exciting for me. I am in GALLEYCAT and NEW YORK MAGAZINE. How fun is that? But I must say that DAVID still wrote my favorite review. I mean how can you beat boogers? 10:30 pm and nearly 80 degrees!!! I kidd you not. The VERY day I buy a wool Norwegian Sweater. Go figure. One more week in Norway. It is hard to know where to begin. I cannot tell you about Selje. How green the water was. The air with a chill. I cannot describe the sheep at Vestkapp. Bounding away in fear then stopped by hunger and the security of their mother. I am unable to describe the houses of stone and the windswept cliffs. The topsy turvey houses askew of Bryggen. And the surreal time. The darkness of the evening which never comes completely. Midnight in Bergen. The dusk turns into dawn bypassing night. Thousand year old churches. What can I say about buildings that are forever? 10:30 pm and wrapped in a wool blanket. We are packing tonight and taking the boat to Bergen tomorrow. Like the first draft of a novel my thoughts on travel are sprawling with no cohesive plot. I yearn for the trim cozy neatness of Norwegian huts. The sharp sides of the Geiranger fjord seen by ferry. A rumble in the distance. Like most things in life opportunity can be fleeting and must be seized. An avalanche caught in time. Suspended. My prose has layers of meaning like a village caught in flood waters a century ago. The foundations of the houses a mirage through the water. Which is real and which is merely the reflection? As I look out the window of the cabin in Rand one last time. Norway is more than an inspiration. It has allowed me to touch my past. 8 AM Foggy cold. REALLY foggy. These are TJAEREKROSS and were placed on this barn door over three hundred years ago to keep the bad gods out. I ran my hand over the rough contours. Was it cow blood? Paint? Plant extract? This is the inside of the barn next to the farm house. My father was born here in 1920. My family can be traced back from this farm for three hundred years. The house perches high over Nordfjord. I am transported back hundreds of years. 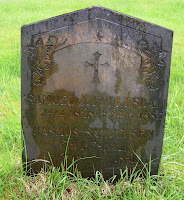 I see names of my ancestors on headstones. I heard a loud rushing sound outside the cabin door. Air conditioner? No. Of course not. So I will leave you to your weekend. By Monday I will have left the mountain cabin at Rand and be staying in Bergen. I have not forgotten LOTTERY. I have not forgotten that I will soon be an author. But I am remembering what it is like to be a writer. CAN YOU SAY WHITE KNUCKLES? NOTE: Thank you to DAVID for the wonderful review of Lottery (and posted on my birthday! How cool is that?) David acquired a copy of my ARC from EBAY (I noticed someone put two more up for bid!) They have gone for as high as $68 and as low as $26. My offer still stands. I will sign any ARC that someone mails to me and I will send it back! and take a picture of a reindeer crossing. I would have taken more photos but I was required to scrunch up in the far corner of the car so we would not tumble over the edge of the thousand or so sheer cliffs that we flew around. Our survival was a testament to the incomparable driving ability of my cousin Helge. We took a short walk up the hill (read steep mountainous vertical climb) to an old ski jump. You make one miscalculation and you are water skiing. We have this view all the way down the fjord. I woke up to mountains glistening with snow towering over me and the sharp smell of the sea over a thousand feet below. My next character will have these experiences. My writing will reflect this. Runic letters. Learning a new language. Does it seem like your writing is stale? How about looking at it from another perspective? 9:30 PM and WARM finally. Your Norway correspondent coming to you from the Northlandia Otta hotel. Deep in the mountains. I dined on MOOSE! It was succulent and I did not feel bad at all. I am quite insensitive that way. The church found in Norway -- made of wood and covered with tar which has made them last hundreds of years. You look at familiar things in different ways whether they are letters, words, or things. A thing can endure. Last through the ages and be seen with new eyes. And there are always the trolls that try to bring you down. Trolls are all over even in Norway. Pinch their tiny heads and step on them. A portion of this church was built nearly a thousand years ago. We walked to another church that is considered new. Two hundred years old. Kind of puts my writing in perspective. 10 pm and warming up to merely frigid. Norway delivers surprises around every corner. The churches are older than anything I have ever seen outside of dinosaur bones. The grave yards full of tombstones and poignancy. Why is this web here? Notice how cleverly the shrub is planted? Does it have some special significance to the departed? I wondered about this as we strolled back to my cousin's house. How can you not feel all's right with the world when you watch sheep? Norway can make you ponder these things. Tomorrow we begin our circular journey up to Nordfjoreid down to Bergen and across to Voss then back to Oslo. You need to figure out where to start and how to finish. And sometimes the end leads you right back to the beginning. 10:44 PM. It is bitterly cold here in Norway and doubly so after finding out the news. I hiked through the forest to a small hytta (cabin) next to a vann (lake). Just a wood stove. Bunks. No running water. The only sounds are made by birds. Grass and small trees grow out of the cabin's roof. This is a place to write. This is a place to recover one's soul. I have had a place like this in my mind for some time. Now I have been there for real. Here in Norway I have seen they exist. I think of Miss Snark here. Do not fill her with guilt by asking for more. Accept what she has given. Let her retreat to the hytta. 10:30 PM and a day earlier than most of you. Rain pelting down and glistening on the windows. We are crawling along a one lane road. My hand cuddles my camera. My cousin Helge wants us to see moose. It is possible we will see one. Or none. 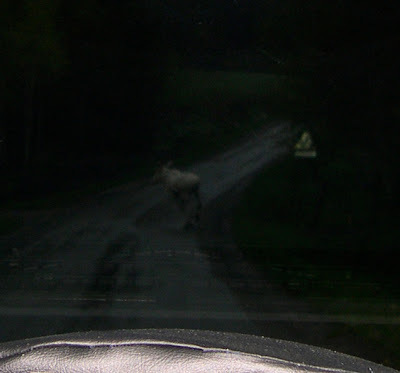 We come around a sharp curve and there standing in the road is an albino moose. There may be only 2 or 3 in country. As he lopes into the woods he raises his head and stops giving me enough time to roll down the window and take another photo. My flash catches drops of rain in mid air and reflects off his eye. 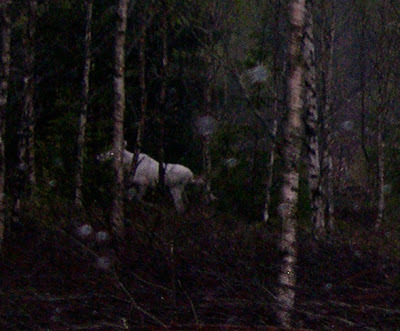 Our first moose is an albino and Helge had never before seen one. 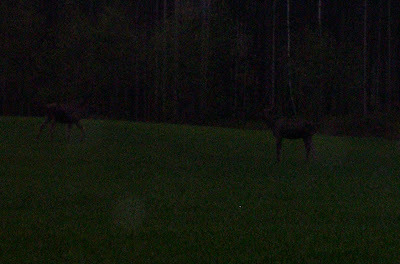 Two more moose out in the meadow. In my mind I still see them standing. Still hear them crash through the bush. You must always use your eyes. My cousin said to be in Norway May 17 and now I know why. There are flags, parades, and national costumes. Each city and small town has their own unique celebration. Even Norwegian dogs get into the act. Everybody marches in their regional costumes accompanied by children from each school and grade. Afterward we drove through the countryside. Tight winding narrow roads and scenery that would unfold like a magician's sleight of hand. Unexpected and revealing something surprising. Tomorrow is a day of planning. I was reminded of how it is when you have an exciting premise for a novel. As impetuous as you are -- you have to organize your thoughts. The plot must be laid out with care. I have much to write about. And even more to think. Here I am in my cousin's back yard. Spydeberg. I am there in the shadows. BLOGGER IS IN NORWEGIAN! HOW COOL IS THAT? Flying across the polar route. Out my window there was a thin sheath of obscured magenta ribbon bordered by wide band of iridescent blue sky above and pewter clouds below. It was not dark it was dusk. It was not night. The orange ribbon widened slightly and then narrowed as I flew over the gulf of Boothia approaching Baffin island. Earlier I thought of Holly Kennedy. I flew over Lake Athabasca which I assume is near the town of Athabasca. Funny how a name brings back the atmosphere of a book. Athabasca is where Holly grew up. Where Tommy and Max lived. Where the fire pit was. The clouds below are substantial as puffs of cotton or vapor blown out of a frigid mouth. So where has my day gone? Wrapped up into the orbit of the earth? Sucked out of my watch and waiting for me until I return in three weeks? It is still light. I have re set my computer. Just over Sondre Stromfjord it occurred to me my geographic ability is less than stellar. The names on the map. They are stories. They are settings. I try it on for size. I could live on SAS food. There was even a menu so I will not forget. I spend hours looking out my window. Now when I write about going over the polar route I will not leave out the most important part. It is always light in May and dark in December. Brilliance lies in the details. And it is still light. The Olympic Range subdued by twilight. Perry sees these mountains each day as he looks out over the marina at dusk. Know what your character sees. See what your character sees. I am in packing denial. I emptied my suitcases when I got to Seattle. Bought socks. Warm fuzzies. Checked the temperature in Norway. Bought more warm fuzzies. Tomorrow it is off to Copenhagen then on to Oslo. I will post my adventures on my blog. It occurred to me that things will be different there. I will write about them. Not in a "Gosh this is strange!" way, but in a "My goodness this is facinating!" way. Think of our novels. How we write them. With affection, like they are close friends which we are revealing to others. Not like dirty little secrets. This is also research for another novel I am editing. A way of learning more about my father and where he came from. Opportunity to write something new and different. Multilayered. Each thin stratum meaningful to different readers. A virtual caravan. An imaginary tour. CAN YOU SPELL S-T-R-E-S-S- BOYS AND GIRLS? It was the fifth day of spicy chicken sausage from Costco. Almost nearly the point where we make that right turn to California across the expanse of the Pacific. 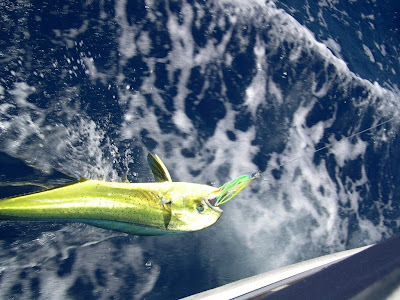 And he hit the lure. We saw him far out digging through the waves. Maybe a thousand feet of line. Pulled him in. Hand over hand. All good things take effort. 5 pm and 84 degrees. Two more random facts about me. I also am intense. Very intense. I love to talk. I love meeting new people (or old people for that matter). In a few hours I will be on my way to Seattle and then on my way to Norway. I am not packed. "What are you doing instead of packing?" I hear you ask. I am trying to write down my top ten all time favorite novels and explain why. I am also trying to narrow down my top twenty narrators down to five. But it is better than packing. I will let you all guess how many warm clothes I have. Because this is a question that is being asked of me so often that I figured I better sit down and think about it. Each time I'm in a music store I completely forget which songs I want. When I go to a bookstore I blank out when I try to think of an author's name or book title. It stands to reason that I have trouble remembering clearly which books have shaped me into the writer that I am. My mind goes all wobbly and I wonder. I mention three or four novels that come to mind and then walk away in a daze. Dissatisfied. I know I could do better. Five minutes later I have a perfectly glorious list of ten stunners. Why oh why did I not write them down? Well. That's what I'm doing now. But you don't know who was sitting at the table across from us at Cassis in Honolulu. Some cast members of LOST and a hobbit from Lord of the Rings. I displayed my ARC prominently on our table but no one came to ask for my autograph. FACT NUMBER 4 ABOUT ME. I practice signing my name so it comes out flowing and graceful. 10:00 pm and 77 degrees. Good fun networking with other writers. My friend Andy and Lisa from the Maui Writers Retreat and Conference. Andy is a pilot and tells me flying is safer than driving. But I want to believe him. Badly. We got talking about finishing novels when you have to work and are busy. It's tough. When you have kids-- a demanding job. Family obligations. No extra minutes. You have to carve some out of your day for yourself. My son is grown. For the past three years I was able to make time to write and it was easy for me to give advice. "Just sit down and write!" I would say and feel a bit superior. It just takes determination. Isn't that so? I am here to tell you it's not that simple. Lottery is a toddler now. Almost in preschool. I start editing book 2 and the publicist calls. I begin to create another chapter and my editor calls. I go back to studying the plot structure and I get interview requests to be completed via email. Remember how I said take five or ten minutes of free time and add a few sentences? I was wrong. It seems like I need to know I have all day before I can relax and write a paragraph. So my good friend and author Holly Kennedy said sit back and enjoy the ride. But don't sit in the back seat and do nothing but watch the scenery swoosh by. Or you might get car sick. The soon-to-be-debut (the "T" is silent contrary to what DH says) author. Toiling on her next novel? Snapshot by Dr. Ian. World famous combination radiologist/photographer. 9:30 pm and 77 degrees. Cool. What was I doing? Oh yeah. I have been tagged. By like six or seven people. I have lost count. You see. I get distracted. I don't do chain letters. You know those emails that give dire warnings if you don't send five animated flapping angels to sixteen of your closest friends? I break the chain. DH says I am tempting fate. OK well. Here goes. 1. Three tags for thinking blogger. Since I can't remember who all tagged me I conjecture that I am incapable of thought. I am unworthy and must decline this award. 2. Two tags of writerly questions. Twenty in all. It starts with "DO YOU OUTLINE"
"I DON'T NEED NO STINKING OUTLINE!" Oh bad attitude. Very bad attitude. Go to corner. Hang head. Until you can contribute something positive Patricia you cannot join the group. 3. List nine random things about yourself. I am flippant. I don't follow instructions. Um. I am forgetfull. OK, I think I'll google myself again. Well this is totally cool. So you see. I am entirely too busy to participate in tagging. OOPS! Look at the time!!! 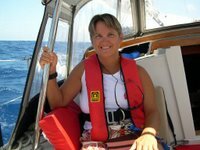 WHAT DO SAILORS AND AUTHORS HAVE IN COMMON? Read today's blog for the answer. A photo taken from the deck of ORION anchoring out at Makua with three of our friends: Exotica, Tere Hau Nui, and Excaliper. 6:30 pm and 81 degrees. I just got finished reading the most amazing book. Blogging gives you the opportunity to meet so many different people. John Elder Robison and I have struck up a cyberspace freindship. We noticed the commonalities of our books: Mine a novel about being different and John's a memoir about being different. Amazon paired up our two books. We traded ARCs. I read his and he read mine. I was blown away. It was funny. Poignant. Smart. Gripping. I could not stop reading. When I finished I just had to write a blurb. Blurb is "author-speak" for quotes about a book. You commonly see them on covers or on the first few pages of a book. "Lottery is a compelling and beautifully written story that will show you how it's possible to have a low score on an intelligence test and still be a genius at understanding other people's feelings and motivations. And you'll learn that having above-average intelligence may mean less than finding happiness with yourself, and the people around you. Lottery is a novel, but it reads like it really happened, right next door to you." - John Elder Robison, author of Look Me in the Eye, a memoir of my life with Asperger's. We found each other's books compelling. I was so honored to read his and I was doubly honored to have him tell me Perry's voice is authentic. I will tell everyone to buy his book. It is the real deal. The true story. So the answer to my question? We listen to each other's stories. We hold a line. Lend a hand. If I have a part you can use...it's yours. If I know how to do a repair, we trade. It's a big ocean out there. We got to stick together. She calls me an "about-to-be-famous-author! Does that mean I have to start making and selling cookies? I guess we will have to get used to the odd ARC of LOTTERY appearing on ebay. Color me amused and entertained. 3:30 pm and 83 degrees. I was told by my friend Holly to watch ebay as ARCs come up fairly frequently. She bought several of her book The Tin Box two years ago. M G Tarquini had the sharp eyes and called me but not before I discovered it myself. I immediately bid but just so you all know my top bid was 5 bucks. That was just so I didn't get humiliated if it had sold for 99 cents! The last I saw it was already up to $15. I will make you a deal. Whoever wins it -- after they read it -- can mail it to me and I will sign it and mail it back! The auction lasts 6 days. We will have a play by play ringside commentary. Fun. Too too much fun. My other great friend and fellow Hawaii author, Mia King, is having a fun contest in honor of all the “good things” that have been happening everywhere, for everyone! CLICK HERE to see how you can get a sneak peek into your future – she’s giving away a one year astrological report or, for you non-believers, an autographed copy of her bestselling novel, GOOD THINGS. I’ve already entered in the contest so may the best person win! I have been listening to the soundtrack of WICKED all day. And I have to share. Because of one song. Well more than that but one song especially resonates. For all of us writers. And that is why we all have to be supportive of each other. Taken by me off the dock of my family's cabin on San Juan Island a few summers ago. It speaks to me of home. I love the black of the land juxiposed against the colors of the sky. Millhousethecat has posted a review of LOTTERY on her blog THE LITTER BOX (which I think is a totally cool name for a blog!). As an author it is hard to see plot elements being revealed but I know it is inevitable. She was gracious enough not to include spoilers for which I am profoundly grateful. I try not to be traumatized or micromanaging when someone wishes to do an interview or review but it is hard not to feel misunderstood! Try and think what I am going through now. LOTTERY is out of my hands. I have no control over what readers or reviewers think or say. Taken in the middle of the Pacific Ocean. The summer I finished my first novel. The year I finally admitted I was over 50. The time I was comfortable with only my thoughts for company. A wild night. Our boat was tossing. We had 12 people aboard and Christmas lights spread from bow to aft. I was on edge. Waiting until we turn for home. Anxious to have ORION back safely moored. Maybe you don't like my sunsets at all. Maybe you would prefer one from Dr. Ian's photo collection. It is brilliant, yes? My eyes have to squint when I look at it but it takes me back to that place. That time. The ringing smacks of his son's feet on the concrete pavement as he flitted back and forth behind us. So which sunset is best? Can you choose? Would you remark on the colors? The composition? The photographic technique? Or are you more interested in the story behind them? Where they were taken and by whom. It is just like a novel. You read it. You love it. Or you are unmoved. "I much prefer deeper oranges and a bit of rose in my sunsets," you say. "I love the way the clouds obscure the sun," he insists. "It is so subtle." How do you review them? How do you critique them? This is how I must think, now.